DNA is a nucleic acid that carries the genetic information in the cell and is capable of self-replication and synthesis of RNA. DNA consists of two long chains of nucleotides twisted into a double helix and joined by hydrogen bonds between the complementary bases adenine and thiamine or cytosine and guanine. The sequence of nucleotides determines individual hereditary characteristics. Since DNA holds the genetic information, the length of DNA molecules and the ratio of DNA to the cell can be different among different species. In this project you will extract DNA from different cells and compare the percentage of DNA by weight. In this project you will extract DNA from varieties of live organisms. You will then calculate the percent of DNA in the cell for each plant or animal cell that you test. You will then compare the results. Material needed for the experiments on this project can be found at home or obtained locally. You need about 3 to 5 days for your experiments and reports. 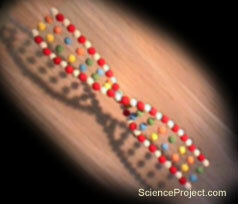 You may also make a 3D model of DNA double helix as a part of this project.